Sacred medieval manuscripts can be appreciated for both their religious and aesthetic values, and I’ve been drawn to the artistry of Christian examples filled with Biblical references familiar to me. In a 2010 exhibition titled “The Art of Illumination,” for instance, the Metropolitan Museum of Art showcased the exquisite Belles Heures, an early-15th-century private devotional book depicting scenes ranging from the radiant Annunciation to the bleak moment of Christ’s death. So when the Met announced “The Washington Haggadah: Medieval Jewish Art in Context,” featuring an “unprecedented” loan from the Library of Congress of an illuminated Hebrew manuscript used at the Passover Seder, I was curious to learn about the work—made about 70 years after the Belles Heures and for a religion different from my own. Curator Barbara D. Boehm and associate curator Melanie Holcomb, both from the Met’s Medieval Art Department, jointly answered my questions about the Washington Haggadah presentation, which is part of a series of focused installations on Hebrew medieval manuscript illumination. Created by renowned scribe and illuminator Joel ben Simeon (born in 1420 in Cologne, Germany), the work bears the date January 29, 1478, and is shown alongside contemporary pieces of medieval art. EBM: What distinguishes the work of Joel ben Simeon? Curators: Joel ben Simeon’s work is distinguished by his “dual citizenship”—he was born in present-day Germany, but also lived and worked in Italy—his beautiful hand, and the humor he injects in many of his illustrations. EBM: Are there many well-known illuminators of medieval Hebrew manuscripts? Curators: Joel ben Simeon is particularly well known because he was so prolific—he signed a number of his works, indicating that he served both as a scribe and as an illuminator. But our visitors will see, when they come back to view other manuscripts in this series, that there are other scribes and illuminators whose names we know as well. EBM: How was the Washington Haggadah originally used; for example, in the home of multiple generations of the same family? Curators: In virtually every discussion of medieval haggadot, authors mention the presence of wine stains from the seder on the pages. That tells us what we could already guess about how it was used. For some, this is a particularly touching aspect. As museum curators, we wish the owners had been a little more careful at dinner! EBM: What is known about its history? The Washington Haggadah was on the art market in Mantua in 1902 and was eventually acquired for the Library of Congress with funds from the New York banker and philanthropist Jacob H. Schiff. You can read more about its fascinating history in the newly published facsimile by David Stern and Katrin Kogman-Appel, who will be speaking at the Metropolitan on April 7. EBM: Were the contemporary works of medieval art displayed near it also used during the Passover Seder? Curators: Because religious law provides few specifications about the types of objects to be used in ritual, Jews of the Middle Ages were free to incorporate luxury items into their holiday celebrations in keeping with contemporary taste. In the illustrations he created for the Washington Haggadah, Joel ben Simeon represents objects used in the preparation and celebration of the Passover Seder that were also favored in Christian homes of his time. We know these kinds of objects were used in medieval seders because they appear in the manuscript, and we are showing about a dozen of them in the gallery. EBM: Why is the Washington Haggadah so important as a work of art? 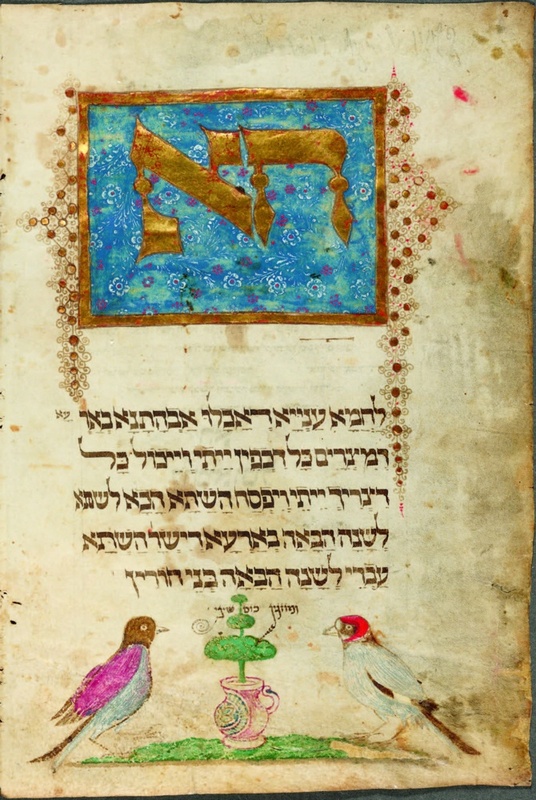 Curators: All illuminated Hebrew manuscripts from the Middle Ages are rare and important. They simply do not survive in the numbers that we see with Christian and secular manuscripts of this period. 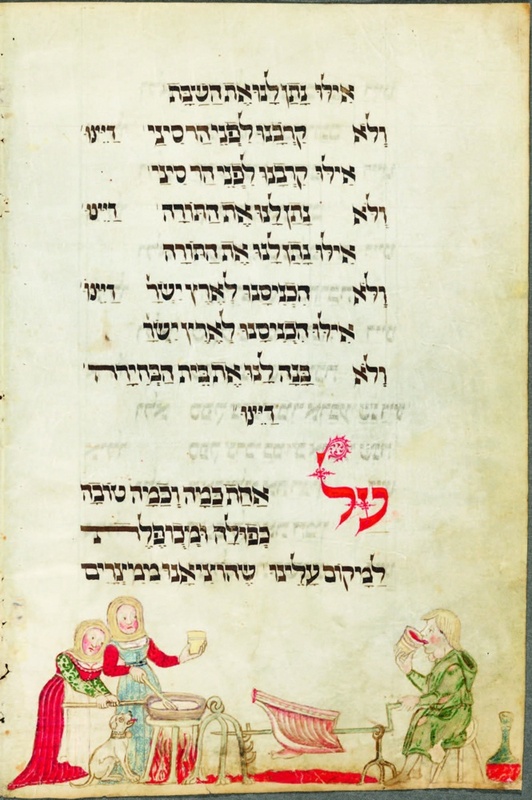 The Washington Haggadah holds a very important place as a great treasure of Hebrew illumination in an American public collection. Illuminated Hebrew manuscripts are more often found in libraries in Europe—including the Vatican—in Israel, and in seminary libraries. EBM: What are the curatorial challenges involved in displaying religious art? Curators: Funny you should ask. Some of these very questions were posed in a recent Connections piece on the Museum website called “Religious Art.” The sacred and aesthetic values are inextricably linked in religious art, and that’s why we love it. EBM: What, exactly, makes this loan “unprecedented”? How did it come about? Curators: The loan both is and isn’t unprecedented. It represents the continuation of an initiative that we undertook several years ago to feature consistently a work of art representing medieval Jewish artistic heritage. We have been blessed by the cooperation of the Library of the Jewish Theological Seminary in realizing that. Now, thanks to a grant from the Berg Foundation, we are expanding our reach with a series of focused installations that showcase gems of Hebrew manuscript illumination from beyond this important New York collection. We were already in touch with several European libraries when Harvard University Press and the Library of Congress, aware of our efforts in this field, began a discussion with us about featuring the Washington Haggadah. We thought it highly appropriate to inaugurate this series with a Hebrew manuscript from our own national library. EBM: Does the Washington Haggadah provide new insights into medieval Jewish life? Curators: The book reflects the vibrancy of the Jewish community in the late Middle Ages and the importance of that community’s artistic heritage. That shouldn’t be a new insight, but given the rare survival of such works of art, it may be surprising to some. “The Washington Haggadah” is on view at the Metropolitan Museum of Art from April 5 through June 26, 2011. 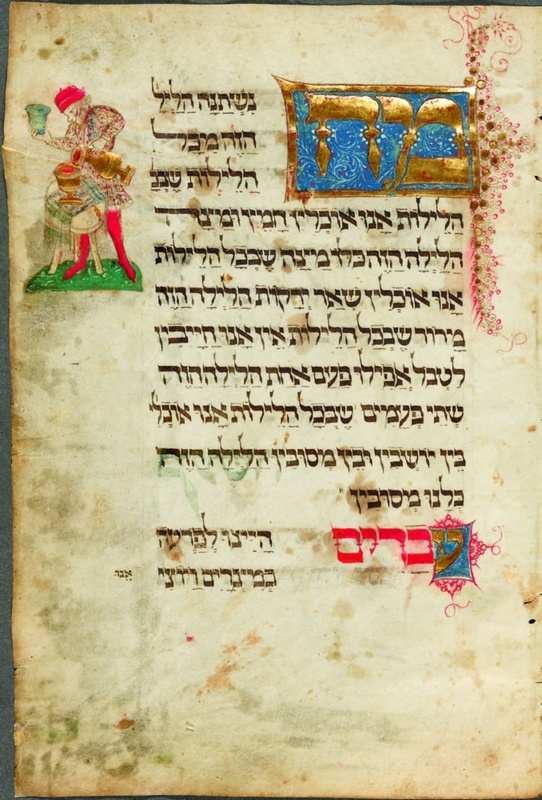 This entry was posted in Europe, Middle East and tagged Barbara D. Boehm, Germany, Hebrew manuscript illumination, Israel, Italy, Jewish heritage, Library of Congress, medieval art, Melanie Holcomb, Metropolitan Museum of Art, Middle Ages, Washington Haggadah. Bookmark the permalink.